On Sunday, August 29, 2010, at 4:54 PM while at home in I was tending to a BBQ on the deck. I stopped and noticed something strange in the sky directly west. I could see a round translucent object with a light. I instantly grabbed my camera and took two pictures and two more pictures with a 5X zoom. All four pictures were taken at 4:53 PM, with my Canon SD890 IS 10 MP digital camera. 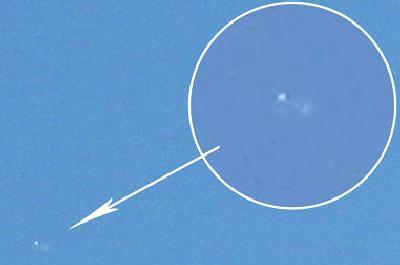 There is photographic evidence of a silver disk shaped object with a bright light on top. It was moving west as I lost sight after about 35 seconds while filming. On August 18, 2010, my step dad and I went out on the porch at 10 PM, and noticed a bright orb in the sky that was closer and brighter than the other stars. We got my telescope out to take a better look. We both saw a row of four lights that were diagonally lined up and they would brighten and fade out until they disappeared. They have been hovering and seemingly getting closer to our house for three hours now. At 10:47 PM on August 16, 2010, I was on a business trip and videotaped something out of this world on my Blackberry Camera Phone. Ex-military men say unknown intruders have monitored and even tampered with American nuclear missiles Group to call on U.S. Government to reveal the facts Witness testimony from more than 120 former or retired military personnel points to an ongoing and alarming intervention by unidentified aerial objects at nuclear weapons sites, as recently as 2003. In some cases, several nuclear missiles simultaneously and inexplicably malfunctioned while a disc-shaped object silently hovered nearby. Six former U.S. Air Force officers and one former enlisted man will break their silence about these events at the National Press Club and urge the government to publicly confirm their reality. One of them, ICBM launch officer Captain Robert Salas, was on duty during one missile disruption incident at Malmstrom Air Force Base and was ordered to never discuss it. Another participant, retired Col. Charles Halt, observed a disc-shaped object directing beams of light down into the RAF Bent waters airbase in England and heard on the radio that they landed in the nuclear weapons storage area. Both men will provide stunning details about these events, and reveal how the U.S. military responded. Captain Salas notes, “The U.S. Air Force is lying about the national security implications of unidentified aerial objects at nuclear bases and we can prove it.” Col. Halt adds, “I believe that the security services of both the United States and the United Kingdom have attempted—both then and now—to subvert the significance of what occurred at RAF Ben twaters by the use of well-practiced methods of disinformation.” The group of witnesses and a leading researcher, who has brought them together for the first time, will discuss the national security implications of these and other alarmingly similar incidents and will urge the government to reveal all information about them. This is a public-awareness issue. On September 3, 2010, I decided to go to Wal-Mart driving on Route 238 approaching Shea Way I saw in a knife-edge position, traveling at an extreme high rate of speed, a large black V’ shape craft. It had five white lights, one in the middle and two lights on each wing. It appeared to have taken off from a field near Route 238. As the craft rolled over to a horizontal position, I saw the lights flash then the craft made a hard right turn and disappeared over the horizon. I drove down Route 238 to the high side of the road and again in a knife-edge position traveling northeast at a high rate of speed was the craft. It appears to have just taken off and the lights flashed again as it rolled horizontal. It headed out to the mountains, and returns making a flyby photo. It passes over and heads south back to the mountains. It circles and lands in a field near the farm complex. I wait for about an hour watching for it to take off again but it never did. The craft was V’ shaped black and non-reflective taper wing design with flashing lights on each wing. It was extremely fast with no sound, and highly maneuverable. Other than the possible knife-edge take offs and tight turns it flew pretty much like any other aircraft. It had the longest wingspan of any aircraft I have even seen. Hey the video on the galactic federation was very cool, nice post! I just bookmarked the post. Good news. It is surely a website worth subsequent. Youve obtained a great offer to say about it subject matter, and so very much know-how. I feel that you know how to make men and women listen to what you need to say, specifically with an problem thats so important. Im delighted to find out this blog site. Two large thumbs up, guy! And also entry. I just stumbled upon your blog and additionally wanted to express that I have really enjoyed reading your blog posts. Any way I’ll be subscribing to your feed then I hope you article over again shortly.
. I severely adore your present articles or blog posts..
this type of is certainly these sorts of existing me personally fresh imaginative and prescient vision proper after recognize that..
. Nevertheless, just retain posting a very good content material content and also I is going to be returning frequently periods..